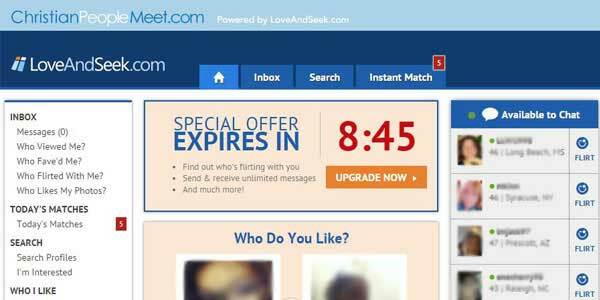 This is first and foremost a very solid and good value Christian dating site. If you are looking for a reliable way to meet Christian women or men, then ChristianPeopleMeet is a great place to start. As the website’s name might suggest, all the tools are at your disposal to meet the perfect partner. And there are plenty of Christian singles using the site, which gives you a great deal of choice. The site is extremely simple to use and there are numerous communications tools to get in touch with the right person. You will also find some great features which are hard to find elsewhere. All of this is available for a very reasonable cost. The most striking overall characteristic at Christian People Meet is the simplicity and straightforward nature of the site. For a start, it should take you no longer than a few minutes between visiting the site for the first time and conducting your first search. More specifically though, there is a full range of communication methods for each user – Private message, instant chat and you can send ‘flirts’ too. A nice tool is the fact that you can view birthdays, which means that if you like a user, you can always wish them happy birthday to break the ice. Users can also access an engaging online magazine. However, the most impressive feature is perhaps the “Instant Match” tool, which will automatically provide you with 5 suggested matches on a daily basis. Not only is this convenient, but you get to give a thumbs up to the suggestions or not, which enables the system to then refine the instant matches it puts your way. You should have no security worries using the site. For a start, during the sign up process, it is made clear that ChristianPeopleMeet.com does not share your details with third parties for marketing purposes. Just as importantly, in the help section there is an entire page dedicated to safe dating advice. 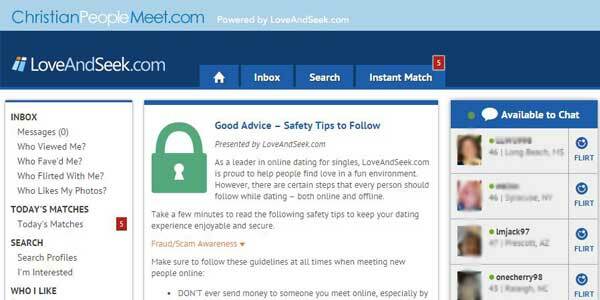 This includes how to spot scammers and how to keep safe when dating offline. This is one of the most prominent positive aspects of the Christian People Meet dating site. With the possible exception of ChristianMatchmaker​, this is just about the quickest and easiest sign-up process you will find. The entire process takes just a few short minutes as you progress seamlessly from one pane to the next. The first asks you to enter basic age, gender and location details. You will then be required to submit an e-mail address and username. Crucially, the next pane asks for a short description of yourself. This is the ideal opportunity to showcase your Christian identity and make clear the kind of partner you are looking for. The final stage is a few multiple choice descriptions of your physical appearance. And that really is it! You are free to then find your perfect match! There are two tiers of membership – Basic (free) and full (paid) membership. The free package will allow you to take advantage of many of the features, including profile creation, search, flirt with other users and you can see who viewed your profile. Full members though have the entire communication toolbox at their disposal, making it significantly easier to meet someone and users can also see who flirted with them. A 1-month membership costs $16.99, a 3-month package will set you back $36.97 and a 6-month plan costs $53.94. This is another area in which Christian People Meet shines. The dashboard is not only pleasing on the eye but makes searching for a partner a simple and intuitive experience. The sidebar provides instant access to see who has viewed your profile, your inbox, your own favorites list and a whole lot more. The clear tabs along the top of the page also give you the chance to view the “Instant Match” profiles of the day. If you scroll to the end of the page, you are also just a click away from useful and interesting dating articles. The two-tier search function is not dissimilar to the search facility at ChristianCafe​. There is a basic search, which will give you a good overview of the possibilities out there, as it allows you to search via age, gender and location. However, if you are looking to be more specific and really hone in on a potential partner, then the advanced search is probably more effective. For a start, you can search via Christian denomination. There are also other search criteria which will help you find the right Christian partner, including relationship expectations. This is a great platform for meeting an appropriate Christian partner. It is not packed full of Christian content and you won’t find a prayer wall or Biblical resources as you might on some Christian dating sites. However, what ChristianPeopleMeet does so well is to provide a relaxed online atmosphere in which it is relatively simple to find a Christian soul-mate. The most important features in this regard are the short personal description when you sign up and the ability to search via denomination and other factors which indicate views on relationships and other values-driven topics. 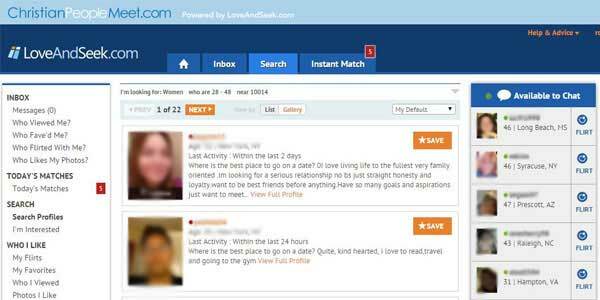 With ever-increasing demand to find a Christian soul-mate online, Christian People Meet does a great job at making this a reality. With plenty of users, it doesn’t matter if you are looking for young Christian dating, senior Christian companionship or anything in between. The right tools are there to make it happen, with some unique features such as “Instant Match” a real help. It is also great value for money. In short, it is well worth checking it out.